A week ago on a rainy day, I sprained my ankle on my way to work. I should have gone home because I almost broke my other foot that same day. X-rays and CT scans later, I have a few small longitudinal lesions on my tendons which is disabling my ability to bend my toes. I decided to tough it out last Friday and head with R to the gym to start training again. I think I lasted all of 10 minutes into the warm up when I jammed my toes horribly and had to get a bag of ice to calm down the re-aggravated injury. Needless to say, I didn’t start training that day. I stayed to watch the class but it made me even more frustrated knowing that it’s difficult for me to learn without actually putting my body through the paces. Class was attacking from the turtle position and the resulting clock choke. R promised to drill this with me at home when the foot starts to behave itself. Saturday was a local BJJ tournament hosted by our gym. R spent the day refereeing on one of the mats and I brought the pup along to watch the competitions. It was exciting to see old friends and teammates compete and do extremely well on the mats! It just made me realize how much I seem to have fallen behind in my own training. I have just under one month to get back into it and hopefully register for my very first tournament! I would have been officially training in Brazilian Jiu Jitsu for eight months at that point and want to get used to that ‘OhmygodI’msonervousIneedtothrowup’ feeling. I’m told you don’t really get used to it per-say. It’s more that your body is accustomed to the adrenaline and doesn’t think it’s nausea. Superb. I’m on a goal to drop weight and train hard for the next 5 weeks. Here we go, wish me luck! …and a helluva lot of burpees. R’s newest idea for our training sessions include his idea of some sort of ‘fun’ card game. He went out and purchased a deck of cards JUST so we could train with them. Tell me I’ve got a dedicated boyfriend. So we decided this week’s training session we would break out the cards. Since I’ve been waiting to officially transfer over to R’s gym my cardiovascular tolerance has decreased. (sad face) We warmed up with jumping jacks, BJJ drills and pommeling before we drew the cards. I asked to split the deck so that we would take turns flipping cards. Hearts – burpees (because, apparently I love burpees), Clubs – pushups, Diamonds – situps, Spades – squats. We would do the number of reps as dictated by the value of the card. Face cards equalled to the number 10, the lucky Ace was 11. We started off at a fairly good pace but I burned out pretty quickly. We drew mostly average deck numbers (7,8,9’s) and a helluva lot of squats and burpees. My lungs were burning near the end and R called it quits when it was clear that I was lagging behind. I was nauseated (the good kind) from the workout and paced around the mats and sipped water. Then it hit me. My legs started burning, then got weak and I was stumbling and laughing as I tried to control the jelly-like feeling in my legs. R counted the cards – and we did 1/3 of the deck for our first time through! He’s optimistic that we’ll be going through the deck easily in a couple of months. Me, I’m a little more reserved. In any case, it was a fun workout and a nice change from our usual cardio sessions. Onwards and upwards! Except, next time I get to shuffle the deck. It’s been almost a week since I’ve had the chance to train, and it’s making me antsy. Because I’m in the process of transitioning to a new gym, certain other responsibilities are keeping me away from the gym. Looking forward to getting back on the mats and training again next week. One thing I’m not missing: Training in a gi in 35C weather. (95F for you American folk) I hear the new gym doesn’t have any air conditioning. Ack. I never thought I would leave. But I suppose that’s the way things always end up. I made a tough life decision this week to leave some of my BJJ family behind and join a new school. It was nothing personal, but some of my own life decisions had to be made and I’ll be switching schools this week. The benefits seem to outweigh the disadvantages but only time will tell. R and I are moving on with our lives and it didn’t make sense for us to train at separate schools especially since our time spent together was already limited by our opposing work schedules. If we wanted to train, it meant spending an additional 3 hours apart when we wanted to go train. This way, we’ll see each other more and we get to share in something we’re both passionate about. I was reading up on some threads on Sherdog and MMA.tv about training and an experienced BJJ practitioner made an interesting point. If you can, you should try to get your black belt from the same instructor who gave you your blue belt. The thing with R’s school is that I can envision myself going all the way to black (hopefully) with the same instructor, and training with the same team. I’ll never forget my first submission, the fun times, the ridiculous jokes and the great team camaraderie from my old school. They’ll always have a special place in my life – they were the ones that helped me fall in love with BJJ. In some ways six months seems like a short amount of time. But when you’re sweating it out on the same mat with all your other friends, it also seems like an eternity. Here’s to all the new friends I’ll make, the trials and achievements I’ll find at my new school. Cheers. I’ve read a few recent articles about why guys should roll with girls and vice versa, and would love to hear your input! I’m putting together a brief FAQ, and thoughts from a girl’s perspective that would probably be appreciated by other BJJ practitioners. All answers will remain anonymous. What burning questions did you ever want to ask your female/male teammates before you rolled with them without the awkwardness of another 7th grade pre-pubescent school dance? I knew it wasn’t the first time I had heard that expression. When a visiting black belt came to give a seminar at our school a few weeks back. I know that I plan on training for a long time and being riddled with little injuries here and there makes me frustrated. I’m sitting here blogging with a tweaked knee and sore ribs. Even before I began to train Brazilian Jiu Jitsu I was a bit of a klutz. Now, little things on the mat seem to get the better of me. For example, I was rolling with T in class earlier this week when he did a simple sweep and I landed at an awkward angle on my right knee. I felt a jarring pain instantly and grimaced with disappointment. I was looking forward to staying after class for open mat and working on the test requirements, and I knew this would force me to sit out for the rest of the day. I left right after class to avoid being asked to roll and explain my cause. However, I’m sitting here blogging after a second class earlier today where I wore my knee brace and grumbled under my breath as settling into mount brought discomfort to my knees. Of course, we’re working on mount escapes this week. I can’t help but think that in the long run, I won’t be worried about all these little tweaks as they tend to be inevitable in a sport that’s so physical. Keeping my eye on training for the long-term, I’m learning to sit out when it’s appropriate and take a break when my body needs it. It also means that my training and progress might be a little slower than I want since I tend to go full tilt when I commit to learning something new. If I want to avoid more injuries, it means being more deliberate with my movements and more aware of my body. Especially when I’m injured. Finally I have a chance to sit down and write this all out! With our recent training trip to NYC (more on that to come later), I’ve now had my Fenom Gi for approximately one month and have washed it countless number of times, and used it extensively. I’ve worn it for approximately 20 classes. I won’t give specific measurements because each gi shrinks and changes shape as they’re washed and used. The following gi review is my personal opinion only and not endorsed by any individual or company. The Fenom Kimonos website is easy to navigate and I quickly found the standard white gi I was looking for. They advertise the following qualities regarding the Lotus gi. Now, I opted to purchase the A1 gi even though I tend to sit on the higher end of the suggested size scale for this gi. My lack of experience with sizing made me hesitant and I still e-mailed the website for further insight. Triin (the owner) from Fenom Kimonos contacted me in a prompt manner and suggested that the A1 gi would be a good fit. I took her suggestion and ordered the gi that same day. The gi took a little over 2 weeks to ship to Canada and there were no issues with shipment. It came packaged in a clear ziplock back with the gi top and pants folded neatly inside. My first impression was that it was surprisingly soft to the touch. The gi top sports a Crystal weave which is a cross between a Gold and Single weave, which allows for durability and a lighter gauge thickness. In fact, once I unpacked my gi top, I immediately tried it on and there was no stiffness as there was with my other gi originally. The detail in the embroidery is unique and looks even more impressive in person. I’ve had quite a few compliments at the gym regarding the quality and look of my gi. As for the gi pants, there seems to be quite a bit more room in the buttocks which is great for movement. The drawstrings for the pants doesn’t bunch awkwardly in the front when cinched down for the right fit. The drawstrings are stitched cotton strips rather than a string and needs to be tied tightly to avoid loosening. 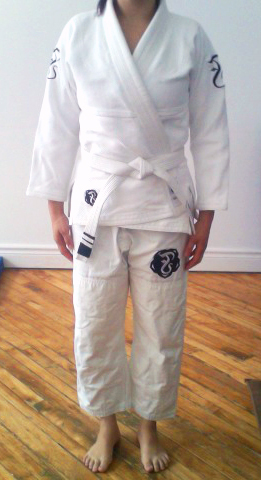 As the photo suggest, the length of the gi comes up right above my ankle and slightly higher when sitting. It’s the perfect length for me. After multiple washes in cold water only and a dry cycle once in a standard commercial dryer there was minimal shrinkage and the gi still fit quite well. The gi has only been air dried after each subsequent wash after the first dry cycle. I was looking for a summer gi for the upcoming hot summers in the city. However, while training in my Fenom Lotus gi, I don’t find any noticeable difference in the amount that I’ve been sweating. My legs occasionally stick to the inside of my pant legs as I’m rolling, but that’s expected as my gi becomes drenched in sweat. Otherwise, the gi allows for a full range of motion and the collar is stiff enough while still being comfortable to wear. I like the subtle feminine quality of the branding and embroidery without it being too obvious on the mats. Overall I would give the gi a ranking of 8/10 for a combination of comfort, fit, design and durability. The collection of photos are after one month of use.